Companies Investing in Video Make More Revenue. Faster. To attract new customer’s attention online, you need to be informative, entertaining, or both. Savvy marketers know video is the most effective tool in their arsenal. 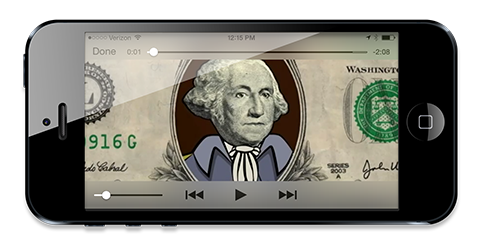 But video also helps companies make more money faster. Especially when compared to companies that don’t use video. Companies using video grow revenue 49% faster year over year. That’s compared to companies who are not using videos. Video is not cheap. It’s also not easy. You can’t exactly have a team of interns knock out a year of great video content in a week. Unless of course your interns are Speilbergs and Kubricks in the making. Then kudos to you. In a separate study by Demand Metric with Vidyard, 70% of respondents report that video converts better than any other medium. So yes video requires a greater capital investment. But with that you get better more qualified conversions. And more conversions equals more money. Organizations using video get 41% more web traffic from search. Why is this you may ask? Well…for one YouTube is the second largest search engine in the world. A lot of people forget that AND it’s owned by the LARGEST search engine in the world. By far. Need more stats? Forrester has reported that you are 53x more likely to get first page results on Google with video. And ReelSEO has put forth that homepage videos increase conversion rates by 20% or more. So clearly video helps search and engages an audience better than sifting through pages of text based search results. Companies using video on their websites have 34% higher conversion rates. What’s funny about this number is one of our case study clients saw a 34% increase in conversions. Exactly 34%, the same as this study. One of the main reasons video helps conversion rates, is that conversions are driven by snackable content. Snackable content are those little bite sized videos that viewers love to consume. It’s a choose your own adventure for the audience. They find little video snippets they need to make more informed decisions. Plus video provides sales enablement and customer retention opportunities for savvy marketers. When you can measure the sky rocketing conversions on your website, your video marketing budget should increase as well. Whether it’s top of the funnel brand awareness videos or post sale technical support videos, video works. Humans have always been visual learners and thinkers. From the dawn of time we’ve always communicated through audio visual means. So it’s no wonder why video works so well. Because at it’s core, video informs and entertains, at every stage of the decision making process. How is your company implementing video in new or unique ways?